A sterling silver picture frame made in 1921 by Lawrence Emanuel, a British silversmith working in Birmingham, England. This silver photograph frame is has an elegant Art Nouveau profile but is otherwise unembellished; it would show beautifully on a desk, piano, or vanity table. The silver frame has a removable glass panel, a hinged strut, and a solid wood backing secured in place with two silver swivel clips. The outer measurements are 6.88 in. H x 5.13 in. W; the picture opening is 5.25 in. H x 3.75 in. W. Fully hallmarked with Lawrence Emanuel's “LE” maker's mark inside a square, a lion passant signifiying .925 sterling silver, an anchor for Birmingham, and a “W” identifying the year as 1921. Good condition with a few fine scratches and a little tarnish. The wooden backing shows wear and the inner fabric has discolored with age. 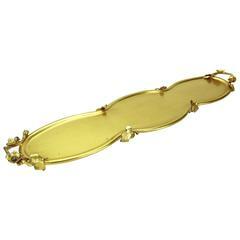 Large Sterling Silver Gilt Art Nouveau Tray by Marie Zimmermann, 21.75 in.